Ireland is a place of mystical, enduring appeal for many, including the millions of Americans who claim its heritage—over one-sixth the current U.S. population, according to the latest census. 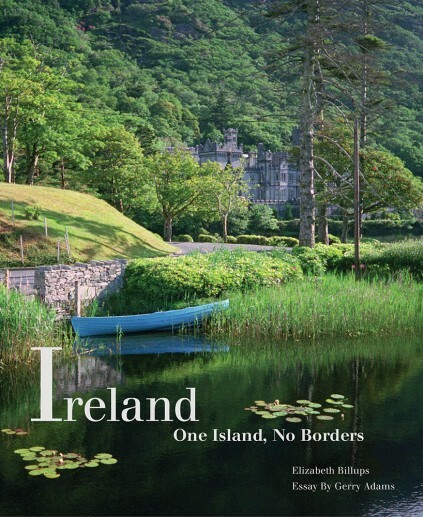 IRELAND: One Island, No Borders presents the country as seen through the eyes of one of its most famous and passionate sons, Gerry Adams, the renowned leader of Sinn Fein, and Elizabeth Billups, a Santa Fe-based photographer and activist who fell in love with the country of her ancestors. This unique collaboration reveals the Ireland not always seen in guidebooks, as well as a side of Adams not usually captured in the news. Adams shares personal anecdotes and family stories along with relevant historical details, legends, and myths, complemented by Billups’ photographs of their favorite places throughout the country, and impressions culled from her many visits. His essay provides a useful overview of Irish history and the long sequence of events that led up to “The Troubles.” His discussion of the historic Good Friday Peace Agreement, of which he was the primary architect, adds an important dimension to the text. Gerry Adams has written over a dozen books. What makes this one unique is the focus on his deep love for his country, its beauty and its people, as well as on his steadfast political vision. Looking at this gorgeous volume and reading his text will make any reader understand why he has fought so long and so hard for peace and for a united Ireland—and why so many people the world over share his and Billups’s great love of Ireland. Elizabeth Billups is a Santa Fe-based photographer, philanthropist, and political activist. She is currently on Nuclear Watch New Mexico’s steering committee and Alliance for the Earth’s Guiding Council. She is co-founder of Apsara Global Arts, a company that supports artists and weavers in Cambodia and Laos. Billups also has worked with the American Indian Movement, the International Indian Treaty Council, and Native American poet-activist John Trudell. Her photography has been exhibited in both the U.S. and Ireland. Gerry Adams has been president of Sinn Fein, the largest all-Ireland party, since 1983. He served as a member of Parliament for West Belfast from 1983 to 1992 and from 1997 to 2011. Since then he has been the Teachta Dála or representative to the irish Parliament, the Dail, for Louth since 2011. Heralded as “a gifted writer” by The New York Times, he is the author of a volume of fiction, THE STREET AND OTHER STORIES, as well a several volumes of non-fiction, including A FARTHER SHORE: Ireland’s Long Road to Peace, which was published to wide acclaim by Random House in 2003. He is a native of Belfast.